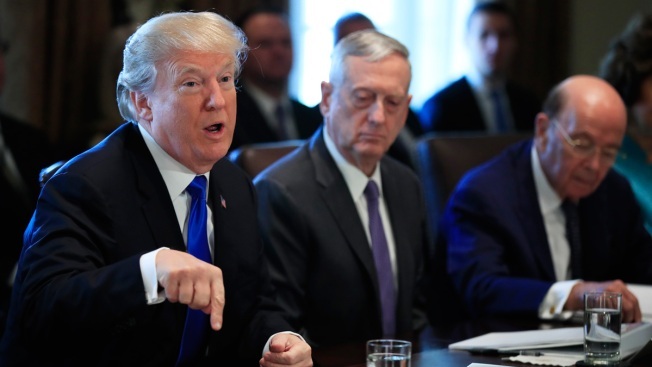 President Donald Trump with Secretary of Defense Jim Mattis, center and Secretary of Commerce Wilbur Ross, right, speaks during a cabinet meeting in the Cabinet Meeting Room of the White House in Washington, Wednesday, Dec. 6, 2017. Life may be about to get easier for people with rich parents. They can thank the Republicans' tax plans. Part of their prep school tuition could be shielded from taxes. A larger chunk of their inheritances would be free of estate tax. Family-owned businesses they have a stake in could be taxed at a discount. Stock portfolios gifted to them by their parents may keep climbing because of lower corporate tax rates. And their parents could enjoy a bigger child tax credit than poor working families would. All told, such perks could further widen America's increased wealth gap. "It's a pretty clear case to make that this helps wealthy children because they're the children of shareholders," said Kimberly Clausing, an economics professor at Reed College in Oregon who has worked on research with the left-leaning Washington Center on Equitable Growth. Government and outside analyses of the House and Senate tax bills show that the benefits would flow disproportionately to the wealthy. Aides to President Donald Trump argue that lower tax rates for companies and the wealthy would trickle into substantial pay raises for middle-income workers. In fact, Trump told middle class families at the White House on Tuesday that the tax cuts would leave them flush with cash. "You're going to be making so much money (you're) not going to know what to do with it, perhaps, I hope," the president said. Yet most mainstream economists and Democratic lawmakers have said the top 1 percent of earners are unlikely to spread around much of their expected windfalls. And the Senate and House bills could worsen wealth inequality, said Daniel Hemel, a law professor at the University of Chicago who was a visiting counsel at Congress' nonpartisan Joint Committee on Taxation. Most U.S. households would pay lower taxes over the next eight years, a benefit for the middle class. But the gap between the rich and everyone else could widen because the biggest tax cuts would still go to the wealthy. And if the individual tax cuts in the Senate bill were allowed to expire as scheduled in 2026, one remaining element could squeeze the middle class and working poor: Standard deductions and personal exemptions would be adjusted at a less generous gauge of inflation. That change would amount to a tax hike that would help pay for cutting corporate taxes permanently. "Over the long term, this is really one better than the Sheriff of Nottingham: It's taking from the poor and giving to the rich but doing so in a way so subtle that working-class Americans will really have to be paying attention to realize what's going on," Hemel said. So just how would rich kids keep benefiting? Tax-free profits from 529 college savings plans would now be eligible to cover $10,000 worth of costs at private elementary and secondary schools. This change would largely serve the wealthy: Their enrollment in private schools has remained stable for the past half-century while middle class students increasingly rely on public schools, according to a research paper released this year by Harvard University's Richard Murnane and Stanford University's Sean Reardon. The move would also worsen inequality by enabling wealthier parents to invest more in their children's schooling. Between 1972 and 2010, wealthier parents spent increasingly on the education of children under 6. The gap between their spending and those of poorer families has increased four-fold since 1972, the paper notes. Evidence suggests that this spending gap has continued to widen since 2010. An estate tax is now paid on fortunes above $5.5 million for individuals or $11 million for couples. The Senate bill would double those thresholds through the end of 2025. The result is that fewer rich families would pay any tax on inherited estates. Those families that would still owe tax would pay less. The House bill would eventually eliminate the estate tax altogether, saving wealthy heirs nearly $20 billion a year. Among the likely beneficiaries: Trump's own children. Both the Senate and House plans would reduce taxes on companies whose profits double as the owners' personal income. Republicans say this lower rate would help small businesses and entrepreneurs. But such "pass-through" companies, whose profits are taxed at the owners' personal rates, include lucrative partnerships and sole proprietorships — including much of Trump's business empire. A lower rate for them would enable many rich Americans to consolidate their wealth. This could further fuel income inequality. The Treasury Department noted in 2015 that the share of income going to the top 1 percent of earners had doubled between 1980 and 2013 at a time when median household incomes, adjusted for inflation, barely budged. It noted that more than 40 percent of the additional income for the top 1 percent came from greater use of pass-through companies. Trump has bragged about the spectacular performance of the stock market since his election. Stock prices have climbed in part on the likelihood that corporate tax rates will be slashed to 20 percent from 35 percent. The White House maintains that these lower rates will cause employee wages to jump. But the advantages may be more likely to go to investors whose children would benefit over time from stock market gains if corporations continue to plow profits into stock buybacks and dividend increases. In 2016, the wealthiest 10 percent of households controlled 84 percent of stocks, according to research by Edward Wolff, an economist at New York University. Republican lawmakers would raise the Child Tax Credit, with the Senate bill doubling it temporarily from $1,000 to $2,000. But the liberal Center on Budget and Policy Priorities notes that the benefits are restricted based on income. It estimates that 10 million children from poor working families would receive a "token" $75 or less. By contrast, a family of four earning $500,000 with two children would, under the Senate bill, receive a $4,000 credit.